Fine Vintage ( Far East) Ltd. This is a May event, which consists of a Saturday afternoon race to or from a nearby destination for an overnight raft up and party, a Sunday breakfast and a race back from the raft up location back to Middle Island clubhouse for a late lunch and the prizes giving party. The race is a celebration of older and "classic-looking" craft, and while it is open to all boats, only those over 25 years old are eligible for the event perpetual trophee. There are also class prizes for Taipan, various Cheoy Lee, Cape Carib yachts and others if a minimum of three entries are registered for a class. 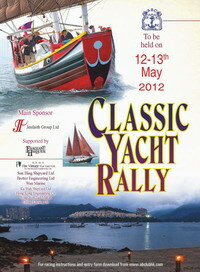 And finally non classic yachts will also receive an overall cup. Sailors may choose to race or rally by following the appropriate course chosen at the start. Boats in the rally division will not have their time taken but will have the opportunity to take part in a great cruising week-end with family or friends. As every year new destinations and format are proposed the NOR and SI will provide all racing details of the year . .
* * * * * * * *.